Tanzania’s oldest and most popular national park, also a world heritage site and recently proclaimed a 7th worldwide wonder, the Serengeti is famed for its annual migration, when some six million hooves pound the open plains, as more than 200,000 zebra and 300,000 Thomson’s gazelle join the wildebeest’s trek for fresh grazing. A massive wilderness of 14500 square km, where every day brings a new landscape and a new adventure. Size:14,763 sq km (5,700 sq miles). – Scheduled and charter flights from Arusha, Lake Manyara and Mwanza. 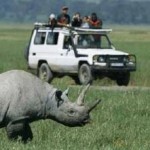 – Drive from Arusha, Lake Manyara, Tarangire or Ngorongoro Crater. -Game drives safari, Hot air balloon safaris, walking safari, picnicking, bush lunch/dinner we canarranged for you. Four luxury lodges, Eight luxury tented camps and Public campsites scattered through the park. 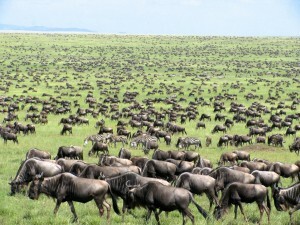 5Day Safari to Great serengeti migration &ngorongoro crater rim. Large section of the Serengeti National Park. The sight of one hundred thousand wildebeest and zebras crossing the grassland savanna is something to behold and is surely one of Africa’s natural wonders. However no matter what time of year you decide to visit the wildlife watching is superb. 9Day Safari to Serengeti- Lake Manyara- Ngorongoro- Lake Natron& Tarangire National Park. 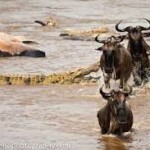 An nine (9) day Tanzania safari package, that takes you to most of the key destinations in the Northern safari circuit. Places you would visit: Tarangire, Ngorongoro, Serengeti, Lake Manyara& Lake Natron. Areas of interest: Crater tour, The great wildebeest migration event, Balloon ride option, Olduvai gorge, The tree climbing lions in Lake Manyara, elephants in Tarangire and people’s culture on your safari tour.